We’d love your help. 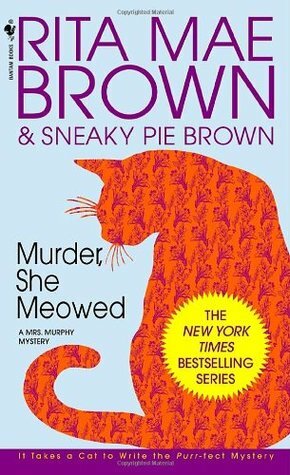 Let us know what’s wrong with this preview of Murder, She Meowed by Rita Mae Brown. The annual steeplechase races at Montpelier, once the home of James and Dolley Madison, are the high point in the social calendar of the horse-mad Virginians of cozy Crozet. The race meet offers a cracking good time with old friends and a chance to get even—on the racecourse—with old enemies. Postmistress Mary Minor "Harry" Haristeen will be in the thick of the action on t The annual steeplechase races at Montpelier, once the home of James and Dolley Madison, are the high point in the social calendar of the horse-mad Virginians of cozy Crozet. The race meet offers a cracking good time with old friends and a chance to get even—on the racecourse—with old enemies. Postmistress Mary Minor "Harry" Haristeen will be in the thick of the action on this day of high spirits and fierce competition. But the glorious thoroughbreds and the pinks and greens and purples worn by the riders do not blind Harry to the dangerous undercurrents that start to surface. There's sure to be some emotional fireworks at Montpelier. Still, no one expects the day to end in tragedy. Found dead in the main barn is one of the day's riders, a knife plunged through the jockey's heart. The only clue is a playing card, the Queen of Clubs, impaled over the fatal wound. Within the wealthy, tight-knit world of horse owners, trainers, and jockeys, the victim had both admirers and enemies. Was the murderer's motive greed, drugs--a pervasive evil in the race world—or sexual rivalry? Luckily for Crozet's humans, the tiger cat Mrs. Murphy is right at home in the stable yard...and on the trail of the shocking truth. But will Harry catch on in time to stop a killer grown bloodthirsty with success? To ask other readers questions about Murder, She Meowed, please sign up. It was okay; not really a favorite. You know how people are always looking for a light hearted read after a depressing and intellectually challenging book? This is the PERFECT (or should I say, PURRFECT) book for those situations. There isn't a whole lot of depth to this book, and the logical train of the thought gets derailed in the first chapter. You'll often find yourself reading about random tidbits here and there that are completely irrelevant; i.e. certain characters cooking abilities, interjections by the animals, and many You know how people are always looking for a light hearted read after a depressing and intellectually challenging book? This is the PERFECT (or should I say, PURRFECT) book for those situations. There isn't a whole lot of depth to this book, and the logical train of the thought gets derailed in the first chapter. You'll often find yourself reading about random tidbits here and there that are completely irrelevant; i.e. certain characters cooking abilities, interjections by the animals, and many many more. Anyways, this book is mostly light hearted and fun. Yes, people are murdered which adds a little damper to the book, but Rita Mae Brown makes it clear that if you don't do cocaine or lead men on you will be fine (unless you are the psychopathic murderer yourself). I found most of this book to be completely unrealistic fiction, but it was fun at the same time (as long as you never try to take this book seriously). Despite the frequent cocaine references and blatant lack of prosecution for heavy cocaine use and possession (one of the characters has a kilo in her safety deposit box at one point, which the police know about and confiscate, and nothing happens to her. That would be a felony for anyone in the real world), I think this would make a good book to read to a 10 year old. I think as long as you make it clear that cocaine is never a good idea, Rita Mae Brown takes care of the rest (you abuse = you die). Ok, I'm going to do a standard review for the rest of the Mrs. Murphy books I read, because I really can't think of something smart to say about every single one of them. Actually, it's hard to come up with something smart to say about any one of them, because they are not really smart books. Though, no, that's not true. They aren't trivial as such, they aren't too easy - or, in other words, they don't hurt my brain while I read them. But I think we can all agree that they are also not "great li Ok, I'm going to do a standard review for the rest of the Mrs. Murphy books I read, because I really can't think of something smart to say about every single one of them. Actually, it's hard to come up with something smart to say about any one of them, because they are not really smart books. But they are pretty straight-forward crime stories, not overly complicated, but also never boring. They live from the interaction of the characters and the settings, both of which Brown handles brilliantly. That she also manages to make the reader fall in love with the characters, not only the familiar ones, but also the new ones she adds in each book, shows that a master she really is. This book was a delightful read. And Rita Mae Brown's characters come to life on the page. As usual it is up to the animals to steer the humans in the right direction to solve these murders. The backdrop is a a Steeples chase. Also, something was mysteriously buried in one of the horse stalls. When Ms Murphy and her owner Mary Harristien (Harry for short) get tangled up in the murders, well you know you are in for a ride. The writing is very colorful and the characters believable-but what makes This book was a delightful read. And Rita Mae Brown's characters come to life on the page. As usual it is up to the animals to steer the humans in the right direction to solve these murders. The backdrop is a a Steeples chase. Also, something was mysteriously buried in one of the horse stalls. When Ms Murphy and her owner Mary Harristien (Harry for short) get tangled up in the murders, well you know you are in for a ride. The writing is very colorful and the characters believable-but what makes this a great series is the voices and thoughts given to the animals about the humans around them. Want a light rollicking mystery? Try this book and let me know what you think. I keep forgetting how much fun this series is. And I'm sure the animals are getting sassier. I am a sucker for the dead body books and this one was unique. You get to try and solve the mystery with the help of the assorted animals and it really works. My first but not my last. This review has been hidden because it contains spoilers. To view it, click here. The annual steeplechase races at Montpelier, once the home of James and Dolley Madison, are the high point in the social calendar of the horse-mad Virginians of cozy Crozet. The race meet offers a cracking good time with old friends and a chance to get even--on the racecourse--with old enemies. Postmistress Mary Minor "Harry" Haristeen will be in the thick of the action on this day of high spirits and fierce competition. But the glorious thoroughbreds and the pinks and greens and purples worn by The annual steeplechase races at Montpelier, once the home of James and Dolley Madison, are the high point in the social calendar of the horse-mad Virginians of cozy Crozet. The race meet offers a cracking good time with old friends and a chance to get even--on the racecourse--with old enemies. Postmistress Mary Minor "Harry" Haristeen will be in the thick of the action on this day of high spirits and fierce competition. But the glorious thoroughbreds and the pinks and greens and purples worn by the riders do not blind Harry to the dangerous undercurrents that start to surface. There's sure to be some emotional fireworks at Montpelier. Still, no one expects the day to end in tragedy. Was the murderer's motive greed, drugs--a pervasive evil in the race world--or sexual rivalry? Luckily for Crozet's humans, the tiger cat Mrs. Murphy is right at home in the stable yard...and on the trail of the shocking truth. But will Harry catch on in time to stop a killer grown bloodthirsty with success? Review first posted on My Blog. It's the day of the annual steeplechase and Mary 'Harry' Haristeen is enjoying helping down at the track with her dog, Tucker. It's a day that the entire town looks forward to and the races this day are good, except for an altercation between two of the jockeys during one race where Linda whips at Nigel and he retaliates. Harry dutifully reports it but no one thinks anything further about it, until Nigel is found dead later that night, stabbed through the heart wit Review first posted on My Blog. It's the day of the annual steeplechase and Mary 'Harry' Haristeen is enjoying helping down at the track with her dog, Tucker. It's a day that the entire town looks forward to and the races this day are good, except for an altercation between two of the jockeys during one race where Linda whips at Nigel and he retaliates. Harry dutifully reports it but no one thinks anything further about it, until Nigel is found dead later that night, stabbed through the heart with the Queen of Clubs stuck to him. Unfortunately, within a few days he is joined by another jockey, this time with the Queen of Spades pinned to him. Now Harry's cat, Mrs. Murphy, puts her nose to the case but even once they find several clues, it's so hard to get the dang humans to pay attention to them. Can the animals point them in the right direction before it's too late to save another one? This is another delightful title in the Mrs. Murphy series, and I enjoyed it as much as the first four. I especially liked the details of steeplechasing in this novel, of which I knew nothing before, and so it was neat to learn about the dramas and illegalities that can go along with the sport. The characters continue to evolve and their relationships among one another are constantly changing and growing. In this title, the saucy Boom Boom Craycroft, a widow and once-lover of Harry's ex-husband F This is another delightful title in the Mrs. Murphy series, and I enjoyed it as much as the first four. I especially liked the details of steeplechasing in this novel, of which I knew nothing before, and so it was neat to learn about the dramas and illegalities that can go along with the sport. The characters continue to evolve and their relationships among one another are constantly changing and growing. In this title, the saucy Boom Boom Craycroft, a widow and once-lover of Harry's ex-husband Fair, has discovered an amazing new life-coaching program called Lifeline, and it was entertaining to see her trying to recruit Harry; most of us know someone like that. With every title in this series, I find myself liking Miranda Hogendobber more and more; she continues her baking endeavor--beloved by the Crozet residents with two and four legs--and reluctantly admits that she has developed a fondness for Mrs. Murphy, Tee Tucker, and Pewter. And speaking of Pewter, she becomes more of a key player and even a hero in this story! We also meet some new furry friends, a handsome older ginger tom named Rodger Dodger and his slinky tortie girlfriend Pusskin, who live in the luxurious stables of Mim Sanburne and provide some invaluable information about the two murders that have stricken the small Virginia town. This book was a re-read for me. But reading about Harry Harristeen and her friends and pets is always interesting, even the second time around. This time there has been a murder following the Montpelier Steeplechase event. One of the jockeys is found at the end of the day in one of the horse barns with a knife in his chest, plunged through a playing card. There are a lot of possible connections. He owed money. He did drugs. There was his girlfriend, another jockey who was also an heiress about to This book was a re-read for me. But reading about Harry Harristeen and her friends and pets is always interesting, even the second time around. There are a lot of possible connections. He owed money. He did drugs. There was his girlfriend, another jockey who was also an heiress about to come into her inheritance. Her brother was violently opposed to her relationship with the other jockey. And then there is the old case of the heiress’s mother, who disappeared five years earlier and hasn’t been seen since. She has been presumed dead, but no one knows for sure whether that is really the case, or whether she simply disappeared on purpose. There are other murders, and other complications as well. It takes Harry’s cat, Mrs. Murphy, and her dog, Tee Tucker, to uncover the real relevant clues to whodunnit, and to what exactly they did. Even after both the current case and the older one are solved, there are still other deaths that only the animals are aware of. Everyone in Crozet is excited about the upcoming steeplechase races. However, the murder of one of the jockeys puts a damper on things. As speculation runs wild, another jockey is murdered in a similar fashion. The police are at a loss as to who is committing murder in the sleepy little town of Crozet. However, Mrs Murphy is on the case. She enlists the aid of other animals in the area, including cats, horses, and even mice. Harry puts her own sleuthing skills to work, and she unearths a clue th Everyone in Crozet is excited about the upcoming steeplechase races. However, the murder of one of the jockeys puts a damper on things. As speculation runs wild, another jockey is murdered in a similar fashion. The police are at a loss as to who is committing murder in the sleepy little town of Crozet. However, Mrs Murphy is on the case. She enlists the aid of other animals in the area, including cats, horses, and even mice. Harry puts her own sleuthing skills to work, and she unearths a clue that may uncover a killer, or lead to her own death. Fantastic! Love these stories. The pace clips along, and I enjoy the interactions of the various animals almost more so than of the humans. The book didn't focus solely on the murder; Harry was left ducking Boom Boom, who wants her to attend group therapy with her, and she was also conflicted over her feelings for her ex-husband, Fair. This was a nice light read. Think will try to pick up the other books for this series. It's interesting to read the two different conversations, one by the humans and the other by the animals. I liked the little bio of the cast of characters at the beginning of the book also, it helped to be able to jump into the story knowing how everyone relates to the other. This is a nice, cozy mystery. There’s a lot of fluffy extra that made the book drag a bit. The animals talking - but the people not understanding them - was a bit distracting but after I got use to it added to the charm. The mystery itself was good, I didn’t figure it out until near the end which is always nice. I would read more in this series. The thing I like best about this series is the continuing characters. This mystery is centered around the world of steeplechase so that’s interesting too, because I know nothing about that. Absolutely a page Turner!! Loved it! A mystery full of plot twists. A cast of suspects and characters. A true challenge for every armchair sleuth. Try to solve the mystery. Not the best book I've read but it was still good. Found to be slow at the beginning. 4 Stars. I love the human and animal characters in this series and I’m very picky when they have speaking parts in particular. A fun read. I don't know what it is about these books but they are so addicting. They're terrible books. But I seriously cannot get enough of them. I was really disappointed with this book. An online friend recommended the books in the "Mrs. Murphy" series because she said the animals talk to each other. That sounded cute, esp. about how they help solve mysteries. It was 50 pages before I came to any animal dialogue. And on that note, the WHOLE book is 99% dialogue but between the humans. So, that made the characters very two-dimensional, meaning NO character devlopement at all. There's no descriptions of the environment such as someone's ho I was really disappointed with this book. An online friend recommended the books in the "Mrs. Murphy" series because she said the animals talk to each other. That sounded cute, esp. about how they help solve mysteries. It was 50 pages before I came to any animal dialogue. And on that note, the WHOLE book is 99% dialogue but between the humans. So, that made the characters very two-dimensional, meaning NO character devlopement at all. There's no descriptions of the environment such as someone's house, or business, or anything. No insight into the characters, such as their inner thoughts or feelings. You have no idea what kind of person everyone REALLY is. You just hear what they say, not what they think. Also, there was way, way too many characters. I had to keep referring to the "cast of characters" at the beginning of the book, which was VERY annoying. Plus, some characters had names I kept getting mixed up, like "Miranda" and "Mim". For one thing, both of these women were nosy, "busy-body" types, so I got them mixed up as people as well!! And one of the women was called "Harry", so I kept thinking she was a man. It's short for her last name. This is not the kind of mystery I'm used to reading: A page-turner with a really suspenseful tone. I'm used to authors like John Grisham or Michael Connelly for a good mystery, and this book is not like that at all. I'm sure it's not meant to be, but it's still a disappointment. I'd compare the style of writing to a YA book, but I've read YA books with WAY more character development and descriptions than this, like The Hunger Games. None of the characters are likeable, and there's a couple of shady ones in there that were just red herrings to the mystery. Due to lack of character development, I didn't care about anyone or cared what happened to them. At one point, I didn't even care who the killer was and almost gave up on it. But I decided to finish it, looking for more animal dialogue. I picked this book randomly due to the title, "Murder, She Meowed." It sounded like "Murder, She Wrote", the old TV series. There's so many Mrs. Murphy books, I didn't know what to pick. I don't think this is the first book in the series. There was also the issue of horseracing, which I don't like and find cruel. Fortunately, there wasn't much detail about that. But I do love horses, as well as cats and dogs. I loved how the cats saved the day, but they weren't as involved as I thought they would be. The illustrations in it are very cute. In spite of all this, I might try another one of the books someday to see if there's more dialogue between the animals, esp. the cats. But not right away. After reaching 100 hundred pages in this book, I had to stop. It was all too boring. I am sorry, I am a country girl, but I cannot take this much horse talk. Brown also wrote like the reader had no grasp on modern language. As an example, she has to explain Harry's use of the word "trolling," when referring to a promiscuous Boom Boom. There were repeated instances of redundant definitions. Up until this point I was able to ignore the little incongruences, but now I really cannot get over them. After reaching 100 hundred pages in this book, I had to stop. It was all too boring. I am sorry, I am a country girl, but I cannot take this much horse talk. Brown also wrote like the reader had no grasp on modern language. As an example, she has to explain Harry's use of the word "trolling," when referring to a promiscuous Boom Boom. There were repeated instances of redundant definitions. Up until this point I was able to ignore the little incongruences, but now I really cannot get over them. In all of her books, there seems to be a lack of tying up the strings. At times Brown over-explains trivial things, but then there are times when entire plot points or characteristics are left out. Where did Blair go? Little Marilyn never seems to be affected by marrying and falling in love with a psychopath! Some of the things that bother me are nit picky, so forgive me, but I have to vent my frustrations with the unanswered questions. Where are the kittens Harry gave Blair? Why doesn't Harry take care of Blair's farm in the later books in the series? Why does the first book foreshadow Blair and Harry falling in love with each other, when she goes back to her ex? Why is everyones still surprised when there are murders in town? After 4 books and finding all kinds of dead bodies, you think they would get used to it. Why does no one realize the cat and dog have saved Harry's life (in the same way) three times? The clues the cat and dog leave for Harry are just too direct for the humans not to notice that the animals know what is going on. As a cat owner, I have to add that cats do not vocalize as much as the cats in these books. If the author had the animals communicate in no verbal ways it would make more sense. If a cat and a dog are taking turns meowing and barking to each other, and then solve the mystery, then maybe someone in the book should notice. "Renntag auf Montpelier, dem Landsitz des 4. Präsidenten der Vereinigten Staaten, James Madison. Mary Minor Haristeen, genannt Harry, dient als Hindernisrichterin, was sie jedoch nicht davon abhält, Informationen zu sammeln. Ihre Corgihündin „Tucker“ darf sie begleiten, Mrs. Murphy, ihre Katze, mußte zu Hause bleiben, wo sie einen Rachefeldzug an der Wohnzimmereinrichtung ausführt. Soweit die Ausgangslage. Dieses kann jedoch nicht verhindern, daß eine zukünftige Millionenerbin ihren Freund verli "Renntag auf Montpelier, dem Landsitz des 4. Präsidenten der Vereinigten Staaten, James Madison. Mary Minor Haristeen, genannt Harry, dient als Hindernisrichterin, was sie jedoch nicht davon abhält, Informationen zu sammeln. Ihre Corgihündin „Tucker“ darf sie begleiten, Mrs. Murphy, ihre Katze, mußte zu Hause bleiben, wo sie einen Rachefeldzug an der Wohnzimmereinrichtung ausführt. Soweit die Ausgangslage. Dieses kann jedoch nicht verhindern, daß eine zukünftige Millionenerbin ihren Freund verliert. Er wird unter der Zurücklassung einer Kreuz-Dame-Karte mit einem Stilett ermordet. Seine Verwicklung in dubiose Geschäfte erfordert anscheinend einen weiteren Mord. Dieses ruft nun Mrs. Murphy und ihre Freunde auf den Plan, aber auch sie tappen eine längere Zeit im Dunkeln, insbesondere kommt erschwerend hinzu, daß sich die Menschen als beratungsresistent erweisen, und auf keinen Hinweis reagieren wollen. Nach weiteren Opfern kommt endlich Klarheit in den Fall, der anscheinend durch frühere Begebenheiten ausgelöst wurde. Allerdings bedarf es zum Schluß noch des ganzen Einsatzes der tierischen Detektive. Der 5. Band um Mrs. Murphy spielt dieses Mal im Pferdmilieu. Neben der Mentalität der Südstaatler kommt noch die der Pferdezüchter und Jockeys hinzu. Wer sich hierfür interessiert, wird eine gute Mischung aus Katzenkrimi und Rennbericht vorfinden. Der Bereich der Tierdialoge ist etwas zu stark betont, aber noch lesbar. Für Anhänger von Mrs. Murphy, wie immer, ein Muß." I think Murder, She Meowed is one of the better Mrs. Murphy book I've read in a while. This one focuses more on the mystery/setting than playing catch up with all the characters. I enjoyed the horse racing aspect of the book, so it was interesting seeing something I know absolutely nothing about. I read these books because they're nice light reading when you don't want to think too much or need something to clean your palette so to speak. The mystery - well it wasn't difficult to figure it out, I think Murder, She Meowed is one of the better Mrs. Murphy book I've read in a while. This one focuses more on the mystery/setting than playing catch up with all the characters. I enjoyed the horse racing aspect of the book, so it was interesting seeing something I know absolutely nothing about. I read these books because they're nice light reading when you don't want to think too much or need something to clean your palette so to speak. The mystery - well it wasn't difficult to figure it out, I managed that less than halfway through. However, I still enjoyed the twists and turns of the book and watching everyone else try and figure out what was going on. The interaction between the animals is some of my favorite (though there was an abundance of new animal characters in this book). And it's always good to see some old characters - like Mrs. Hogendobber, I have to say Mim is something else - at the start of the series I didn't particularly like her, now she's possibly one of my favorites. 3.5 This mystery featuring postmistress Mary Minor "Harry" Haristeen and her crime solving animals Mrs. Murphy(tiger cat) and Tee Tucker (corgi) is set in the world of steeplechase racing. When the murder of a jockey leads to clues in a five-year-old mystery, Harry becomes involved in the search for a cold-hearted killer hidden amongst her circle of friends. I am enjoying this series, and MURDER, SHE MEOWED is another fun installment. Mrs. Murphy, Tee Tucker, and the other animals steal the show 3.5 This mystery featuring postmistress Mary Minor "Harry" Haristeen and her crime solving animals Mrs. Murphy(tiger cat) and Tee Tucker (corgi) is set in the world of steeplechase racing. When the murder of a jockey leads to clues in a five-year-old mystery, Harry becomes involved in the search for a cold-hearted killer hidden amongst her circle of friends. I am enjoying this series, and MURDER, SHE MEOWED is another fun installment. Mrs. Murphy, Tee Tucker, and the other animals steal the show as usual. The animal by-play does not seem all that unrealistic to me; the animals don't "talk" to the humans (or at least, the humans don't understand them) and as someone who lives with a houseful of animals, their behavior seems pretty believable. I like the small town feeling and I'm interested in seeing how Harry and her ex-husband Fair resolve their relationship. People keep telling Harry she's still in love with Fair; can they all be mistaken? This books are in the "light-and-fluffy" category of mystery fiction, and they are delicious. Rita Mae Brown is a prolific American writer, most known for her mysteries and other novels (Rubyfruit Jungle). She is also an Emmy-nominated screenwriter. Brown was born illegitimate in Hanover, Pennsylvania. She was raised by her biological mother's female cousin and the cousin's husband in York, Pennsylvania and later in Ft. Lauderdale, Florida. Starting in the fall of 1962, Brown attended the Un Rita Mae Brown is a prolific American writer, most known for her mysteries and other novels (Rubyfruit Jungle). She is also an Emmy-nominated screenwriter. Starting in the fall of 1962, Brown attended the University of Florida at Gainesville on a scholarship. In the spring of 1964, the administrators of the racially segregated university expelled her for participating in the civil rights movement. She subsequently enrolled at Broward Community College with the hope of transferring eventually to a more tolerant four-year institution. Between fall 1964 and 1969, she lived in New York City, sometimes homeless, while attending New York University where she received a degree in Classics and English. Later,[when?] she received another degree in cinematography from the New York School of Visual Arts. Brown received a Ph.D. in literature from Union Institute & University in 1976 and holds a doctorate in political science from the Institute for Policy Studies in Washington, D.C. Starting in 1973, Brown lived in the Hollywood Hills in Los Angeles. In 1977, she bought a farm in Charlottesville, Virginia where she still lives. In 1982, a screenplay Brown wrote while living in Los Angeles, Sleepless Nights, was retitled The Slumber Party Massacre and given a limited release theatrically. During Brown's spring 1964 semester at the University of Florida at Gainesville, she became active in the American Civil Rights Movement. Later in the 1960s, she participated in the anti-war movement, the feminist movement and the Gay Liberation movement. Brown took an administrative position with the fledgling National Organization for Women, but resigned in January 1970 over Betty Friedan's anti-gay remarks and NOW's attempts to distance itself from lesbian organizations. She claims she played a leading role in the "Lavender Menace" zap of the Second Congress to Unite Women on May 1, 1970, which protested Friedan's remarks and the exclusion of lesbians from the women's movement. In the early 1970s, she became a founding member of The Furies Collective, a lesbian feminist newspaper collective in Washington, DC, which held that heterosexuality was the root of all oppression.